How do I sponsor the event, or purchase an individual ticket? 1. You can register and purchase your sponsorship, table, or individual tickets online. 2. OR, you may choose to download and complete the sponsorship form. Please contact our chair Sam Longoria at (361) 846-0193 to reserve your sponsorship, or e-mail leadershipccainfo@gmail.com. 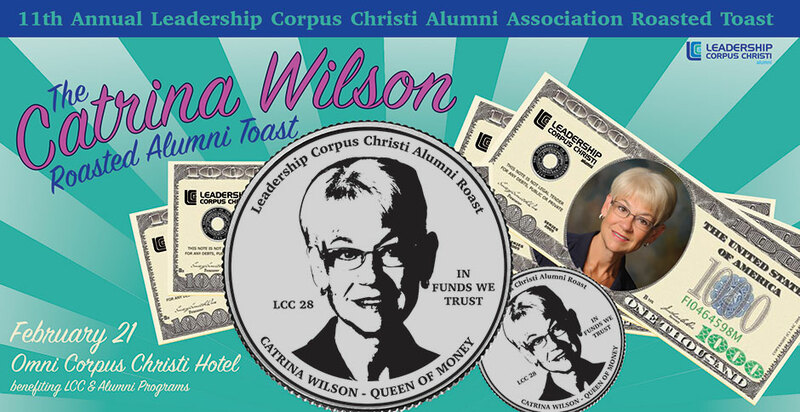 The Leadership Corpus Christi Alumni Association Roast was born from a lunch conversation between then LCCA Chair Omar Lopez, and LCC alum Bill Richmond and Jessica Davila-Burnett while brainstorming a way to help the Association increase funding... "We should have a weenie roast!!!" and the rest is history. In 2009 the LCCA presented their inaugural fundraiser "We Love Bud" – the roast of L. C. (Bud) Harris III, LCC25, and the jabs haven't stopped yet. Year after year, LCCA has honored an association member near and dear to our community by placing them in the hot seat: Chris Adler LCC16 (2010), Dr. Scott Elliff LCC16 (2011), Representative Todd Hunter LCC9 (2012), Mark & Carol Scott LCC17 & LCC16 (2013), Ken Trevino LCC27 (2014), Al Jones LCC6 (2015), Paulette Kluge LCC35 (2016), the duo of Ruben Bonilla LCC1 and Hugo Berlanga LCC3 (2017), and the honorable Judge Loyd Neal LCC2 (2018). LCCA is grateful for the creativity, support, and love poured into the inaugural event by our three initiating alum and is proud to continue the tradition. Omar, Bill, & JDB, thanks for the laughs and for the fantastic means of honoring our beloved members.